The pros and cons to rent a wedding dress are various. You are a bride to be and that is filled with exciting experience. The planning process itself can be a lot of fun, but it can also be filled with a lot of expense. The truth is that weddings can cost an arm and a leg, and one of the biggest expenses has to be the wedding gown. Wedding dresses can cost upwards of several thousand dollars. Unfortunately, if you are like most brides in this economy you may not have that money available to you. Does that mean that you need to stick with some bargain basement dress that you are never truly happy with? Maybe not. A new trend that brides are embracing is to rent your wedding dress. Your wedding dress is one of the most important decisions that you are going to make for your wedding. Many people may think that it is silly to spend a lot of money on a dress that you are only going to wear once. However, the truth is that your wedding gown is what many of your guests are going to be the most interested in. Additionally, how you look on your wedding day will be how your husband remembers you for years to come. Or perhaps most importantly, your image is going to be captured in hundreds of pictures that are going to be looked at for the rest of your life and beyond. With all of that you want to look great. Renting a wedding dress can make this possible. However, you need to realize that there are pros and cons, and before you make a decision you should truly understand them. One of the biggest pros of rending a wedding dress is that you will be able to wear a truly remarkable garment. For many brides, by renting a dress you are going to be able to slip into a very expensive designer gown that you might not have been able to dream of wearing before. For example, if you have always dreamed of wearing a traditional Vera Wang gown, but your bridal gown budget is only $1000 you are not going to be able to make that happen. However, if you choose to rent a gown you may be able to make that dream a reality. 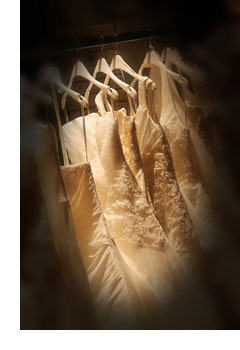 Additionally, one of the biggest hassles on your wedding day is transferring your gown to the wedding location. This is especially true if you are planning a destination wedding. Instead, you can rent a wedding gown from an establishment at your destination to avoid having to travel with your dress. If you are worried about the environment and looking for something that is a bit more eco friendly this could be a great option. Rather than simply wearing a dress once and then storing it away, you can rent a wedding dress and thus put that garment to use several times. Another real pro to rent a wedding dress is that sometimes when you rent a wedding dress your rental package includes your accessories. By including your headpiece, veil, jewelry, and handbag into your rental cost, you can save a significant amount of money. Each of those items can cost hundreds of dollars, and that can more than triple the cost of your dress if you were not renting. However, before you fully commit to renting a wedding dress you need to give some thoughts to the cons of the situation. You want to be sure that you really understand the rental agreement with care. Typically, with a bridal gown rental you are responsible for the cleaning of the dress and any damages that may occur during your wedding day. What are those charges? You should plan for the worst and ensure that those potential charges will not put you over budget. You are also going to be wearing someone else's dress. For some brides this may be creepy. If you are uncomfortable with this idea, then renting a wedding dress may not be the right option for you. Your wedding day is one of the most important days of your life, and you want to look beautiful. Now that you know the pros and cons of renting a wedding dress you can choose if that is the right option for your big day. The key to decide to rent a wedding dress or not is to ensure that whatever you choose, fits into your budget. If you are able to do that you will look beautiful without feeling any guilt on your big day.